Is an apple fritter the best user experience in the world? The second weekend in May I went to the UX + Dev Summit in Fort Lauderdale, and my main takeaway is this: Okahumpka Service Plaza is the best service plaza. I will admit that West Palm is very nice, and I’m sure there are some who will tout Fort Drum or Pampano as being superior, and that’s fine. People are allowed their wrong opinions. But for me, as I got up to speed on the south-bound on-ramp juggling an apple fritter and iced coffee from Dunkin Donuts, I knew that nothing I would experience over the next two days would compare to Okahumpka. And I was kind of right. I figure there aren’t more than a few things you’re ever going to take away from any conference, broadly speaking. And I’m happy to report that, for the latter, we in Web Services are in pretty good shape. From “The Hidden Science Behind UX” through “Designing Design Systems” to “Web Accessibility,” one concept remained front and center: Accessibility first. Why? I know it can be hard. During a design exercise in “The Hidden Science Behind UX” (mostly a presentation about the biological structure of eyes and ears with some analysis of cognitive processes thrown in), many people relied on voice commands to access a hypothetical car’s self-driving capabilities. And it makes sense. You don’t want to take your hands off the wheel while it’s in driver-driving mode. But then, what about people with speech impediments? Whether or not that’s slurred speech or they can’t speak at all? And what about the deaf? Are they not allowed to drive? So we built our interface with redundancies, and made sure to design them in such a way that they were accessible without being cumbersome. And not only did we thus build in functions for all, we also built in redundancies for the car itself ensuring its systems came with failsafes. WebbIE enables sighted folks to see what the screen reader is going to “read” and deliver to the user via text-to-speech which is particularly handy for designers because it presents a visual, text-only version of your site as it’s seen by screen readers Jaws and NVDA. If your site’s markup ends up being cumbersome for the screen reader, or too verbose, you can work to streamline it, making a better experience for the visually impaired and probably writing better code, too. And from a usability standpoint? One of the more interesting and practical UX tools came out of “A Brief History of Cupholders”. The presenter focused much of his time on two sets of question pairs, the Jobs to be Done question pair and the Kano question pairing. 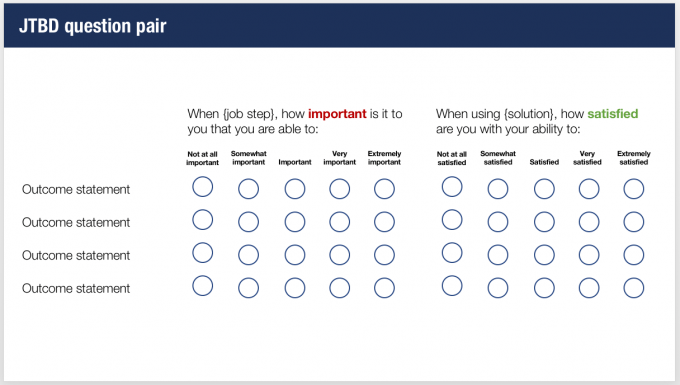 Each question set is designed to insert itself within a customer process, whether that be requesting a patient appointment or holding beverages while driving. Here we have a generic example of how the JTBD question works. For any product or service, you first determine the users’ goal, then ask them how important is step X in reaching goal Y, and how satisfied are they with their ability to complete that step. 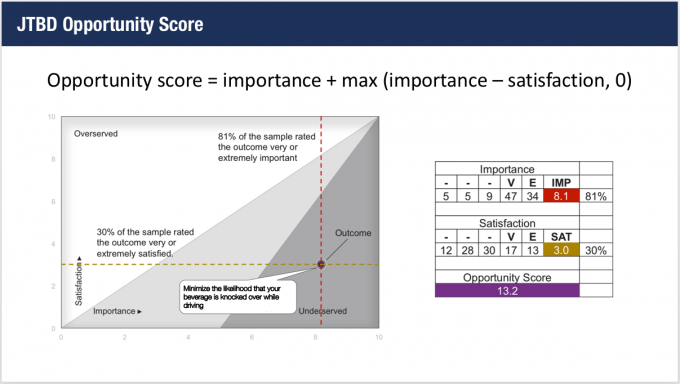 The higher the opportunity score, the more relevant to the user and thus the more demanding of your attention. The presentation also summarized the Kano model. 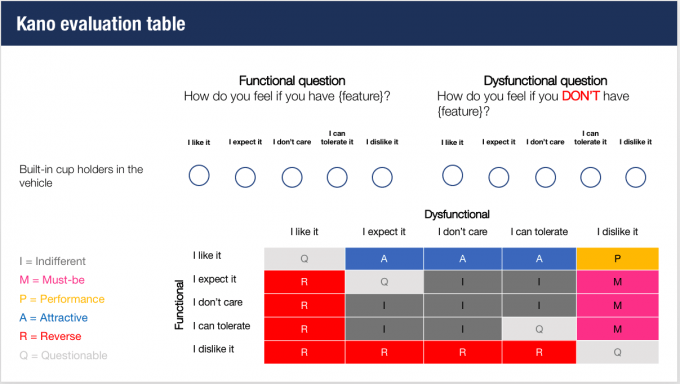 The Kano model is designed to evaluate features in terms of satisfaction and functionality. Question pairs are split simply across two axis with the same scale. Cross-referencing the question sets for each feature or solution provides a roadmap for those features users expect, those that will delight them, and those that can be left aside or marked off the to-do list. Taking these two question models together provides a complete view of users’ needs and the perceived value of solutions, which, taken together, should enable us to focus on the things most important or meaningful to our users. And that one’s the final takeaway: it is no longer enough to be useful, usable, desirable or delightful. We have to strive to make products and experiences that are meaningful for people. And right this second, it’s tough for me to figure out how to make a web experience meaningful, but I guess that’s what the question pairs are designed to discover. I will say this, though: personally, anecdotally, I find no evidence to contradict it. Take, for example, the Okahumpka Service Plaza. When I lived in Orlando, the Okahumpka Service Plaza marked for me the end of Orlando’s sphere of influence. And this is important because Orlando and I didn’t get along. So each time I returned to Gainesville or drove up and out of Florida altogether, the Okahumpka Service Plaza served a distinct demarcation: I was officially on my way. And now that I have kids and interests that draw me back down to Orlando and beyond, it serves a similar demarcation. The Okahumpka Service Plaza is when I feel in my bones that I am well on my way towards some destination, whether that be Legoland, Disney, or the UX + Dev Summit way down in far-flung Fort Lauderdale. And so I stop for a donut and coffee. I make sure the SunPass is loaded for tolls, and I begin my journey–my life’s user experience–for real. And thus it should be with the things we create. We must design our sites, apps, products, whatever to fit seamlessly into the stories of people’s lives. At the very least we must ensure we don’t get in their way. At the very best, our sites should serve as a meaningful demarcation in their life’s journey: the place where a recent grad begins a medical school admissions process. The site where a European diabetes researcher finds experts to help with her ongoing studies. The page where a mom makes a late-night appointment request to find answers about her kid’s nagging stomach pains. These are the stories we must think about. Now think: what’s the journey your users are on?